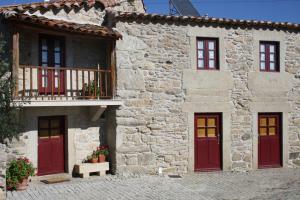 Casa das Quintas price per day from € 70 Located in the Trás-os-Montes region and featuring a pool and typical stone buildings, Casa das Quintas offers views over the mountains. 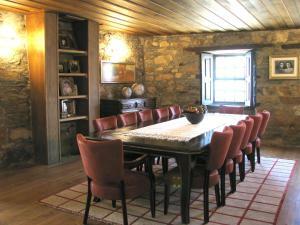 Accommodation is carefully restored and elegantly decorated, mixing rustic and modern styles. Bike rental and a common lounge with TV are also available..
Hotel Parador Santa Catarina price per day from € 75 Set on a hillside overlooking the Douro River, with panoramic valley views, this 4-star hotel combines modern architecture with traditional details. 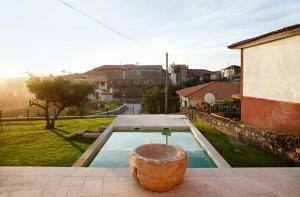 Hotel Parador Santa Catarina is in Miranda do Douro and features a restaurant. The rooms and suites all come with a private bathroom and a flat-screen TV. Hotel Cabeço do Forte price per day from € 55 Located at the highest point of Miranda do Douro, the Cabeço do Forte offers scenic views over the historical city centre. The unit is a 5-minute drive from the border into neighbouring Spain. A breakfast buffet is served each morning in the Hotel Cabeço do Forte. Hotel Rural Solar dos Marcos price per day from € 81 Dating back to the 18th century, this quiet residence is situated in the Arribes del Duero Nature Reserve. Featuring an outdoor pool, it also incorporates a spacious garden with a private chapel. The 4-star Solar dos Marcos offers a restaurant, where guests can taste popular regional specialties as well as international dishes..
Quinta das Aveleiras price per day from € 145 The Quinta das Aveleiras is a tranquil, nature-surrounded farm stay in Torre de Moncorvo. Some of the typical Douro units also include a patio. Several local restaurants are accessible via a 5-minute walk from the Quinta..
Casa do Olival price per day from € 100 Casa do Olival is located in Sezulfe, Macedo de Cavaleiros and offers comfortable rooms and a house with 3 bedrooms. The house includes 3 bedroom, a living area with fireplace and a fully equipped kitchen. Casa de l Bárrio Located in Picote village, within Douro International Natural Park, Casa de L Barrio is a 2-bedroom house featuring traditional regional architecture. It includes a living room with a warm fireplace and sofas. The kitchen has the necessary appliances to prepare meals, which can be enjoyed outdoors..
Casas de Vale de Lobo price per day from € 140 Offering an outdoor swimming pool, Casas de Vale de Lobo is located in Mirandela. Featuring a unique décor and architecture, the unit has exposed stone walls on the façade and a sun terrace. Each has a full kitchenette and a dining table, as well as a private bathroom. Casa Do Lello price per day from € 200 Located in the village of Rabal, 10 Km from Bragança, Casa do Lello offers accommodations for large groups or couples. This self-catering country house includes free private parking on site for 10 vehicles. Each room has central heating and is furnished according to the rural style of the house..
Casa das Arribas price per day from € 120 Casa das Arribas, is situated in the International Douro Natural Park, located in the town of Cardal do Douro. 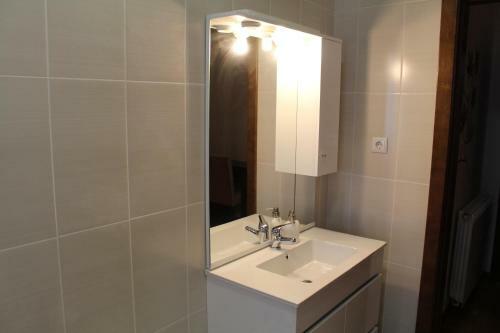 All the air-conditioned rooms feature a private bathroom with free toiletries. 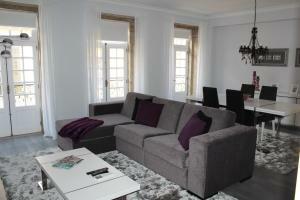 The property offers free private parking to its guests. Quinta Da Pereira E Enricas Agro-Turismo price per day from € 75 Quinta da Pereira Agro-Turismo is set within an extensive farm in the town of Vila Flor. Guest rooms are air-conditioned and offer a balcony. Quinta Da Pereira also organizes strolls around the region. 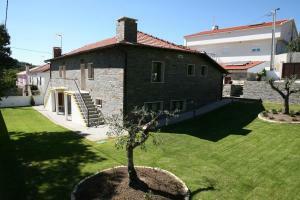 Casa de Vale Benfeito - Turismo Rural price per day from € 45 Located in the village of Vale Benfeito, this country house offers brand new salt water pool and spacious rooms with modern décor. With Serra de Bornes as background, it offers free WiFi access. In the morning, guests are presented with a breakfast while at lunch time or dinner guests can discover the gastronomy of the region by visiting the restaurants located in Macedo de Cavaleiros 7 km away..
A Lagosta Perdida price per day from € 105 With a heated outdoor swimming pool, the family-run A Lagosta Perdida is located in Montesinho Natural Park. 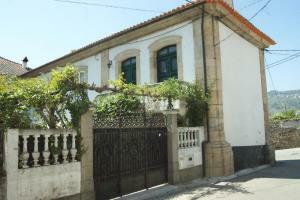 It features a horse riding school 8 km from the property and a 24-hour reception. All en suite rooms have a flat-screen satellite TV and a rustic-style décor. Guests can enjoy a book from the library or a table game by the fireplace in a cold winter night..
Hotel Rural Villa Julia price per day from € 50 Hotel Julia is a beautiful old town house in the village of Samões, which combines historic architecture with elegant contemporary furnishings. Continental breakfast is served every morning in the spacious dining area. Flor Do Douro price per day from € 20 With views of the Douro River and the reservoir dam, Flor Do Douro offers spacious rooms that overlook a lively shopping street. The Flor serves a daily breakfast made from fresh, local products in its dining room..